This is the ''Birdie Babes'' vacation castle of fun!! Great for the entire family. Just unpack your bags, go to the grocery store and it's just like being at home. All the amenities are provided for your comfort, there's also a safe and security system on the property. 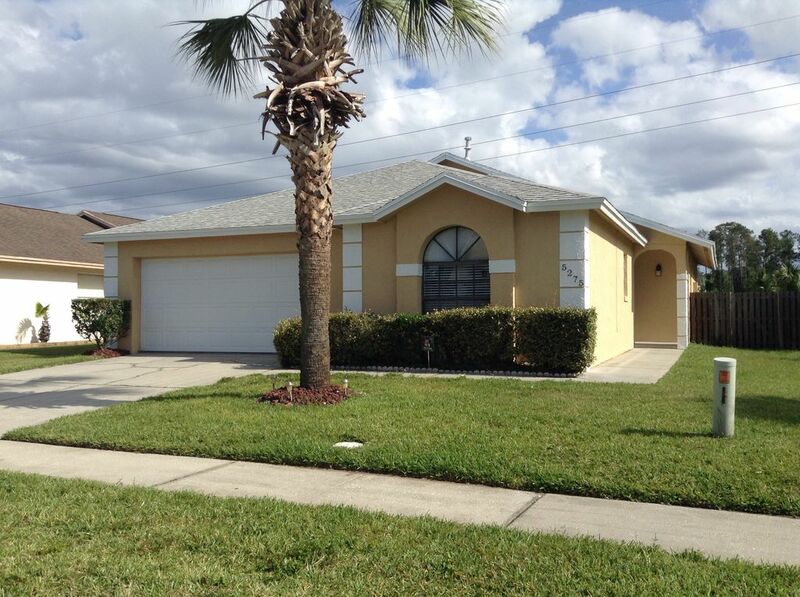 The home is within 3 miles of the Disney Resorts, and several more to Sea World and Universal. You can also relax by the screened in pool and patio with lounge chairs. Depending on the time of year you might want to consider pool heat for an additional $100.00 per stay. There's still plenty of room in the backyard for the children to play. Easy access to shopping, restaurants and entertainment. Bring your family and stay where all the conveniences are there for you! My husband and I have vacationed in Florida in the area for many years and we decided to purchase this home for a rental property due to its convenience. It is a very quiet neighborhood and is just like being at home except for the groceries. This home gives you access to all the parks within 5 miles and has it's own private pool that is screened in plus there is still yard available for the children to play. Pool heat is not included but can be added for an additional fee of $100.00 for the duration of your stay. This property is in a subdivision and there will never be another home built behind us because there is a utility easement. This make our home very private. Our home is located in a quiet subdivision which is mostly owner occupied single family homes. There is shopping within walking distance, Walmart. Located in the garage. You must supply your own detergent. Towels are in both the spare and master bedroom closets. There's also approximately 6 beach towels. L shaped living room and dining room combination. There's a basket in the living room that has children's DVD's in it. In the community park area. Screen enclosed private pool. Heated with an additional cost of $100.00 per booking. Our home was recently painted inside, new window blinds, carpeting and some furniture has been added. The kitchen has had the cabinets repainted and a mosaic back splash added. The master bath has a new ceramic counter top and new toilet and the spare bath has a new ceramic dual sink counter top and new toilet. New lights have been installed throughout the house. Nice House close to parks and golfcourses. We enjoyded our stay in the House and loved the pool. Only negative to say is that the Garden and poolhouse is heading north. Will absolutely recommend the House. Excellent place to stay. Clean, well kept and close to all the attractions. This was the second time we have stayed & thoroughly enjoyed both times. It's a great property in all respects & a great value as well. Nice quiet neighborhood belies the fact that all shopping is close by as are the Disney entrances, excellent location. Have already booked time in 2019 for our next stay. We enjoyed our stay at The Birdie’s Nest! Directions were very clear from the owners about check-in/out. It was very clean. Pool area was great, secluded and relaxing. Location was perfect for us!!! Ran into a small issue with the garbage, which required us to contact the owner directly, but was no big deal. We would definitely come back and stay here again, as the owners were easy to work with. Thanks for a great place to stay during our trip! We really felt right at home. Plenty of clean linens and everything you may need in the kitchen. Would stay again in a heart beat! My family and I loved the Birdie's Nest. It was very comfortable and we felt like we were in our own home. Very clean and well equipped and everything is close by, I highly recommend, definitely will be coming back to this house for now on! A suburb of Orlando, FL, within 5 miles of Disney World, Universal and Sea World. Waterparks nearby as well as other tourist sites. 1 hour from Daytona Beach on the Atlantic Ocean and 2 hours from Clearwater, FL on the Gulf. Interstates are within minutes. Golf and other recreational activities nearby. 20 Mins from Orlando International Airport, 3 Mi. to Parks. We supply a lease agreement with all of our bookings that explains our terms and cancellation policy. We expect to get a signed copy returned upon booking for our records.